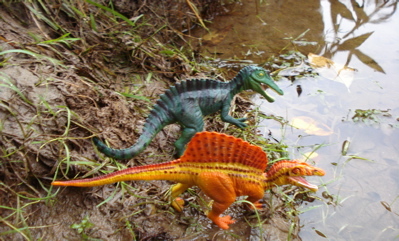 The Safari Spinosaurus is one of the venerable Dinosaur toys. 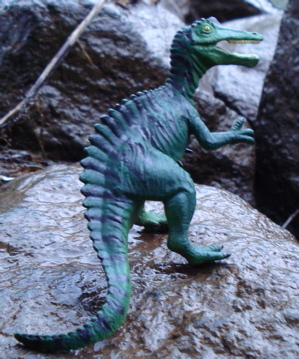 You can find the Safari Spinosaurus hanging around near lakes and streams with its cousin, the Safari Suchimimus, another member of the Spinosaurus family. 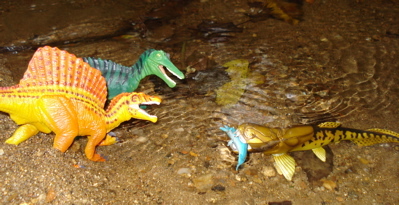 The Spinosaurs are believed to have favored sea-food buffets and take-out-of-the-water establishments. This is because of the conical shape of their teeth and fossils have been found showing fossilized fish scales in what would have been their stomachs (don't ask). They also have other Crocodilian features such as elongated skulls and nostrils perched high up on their heads suggesting a high level of aquatic activity. 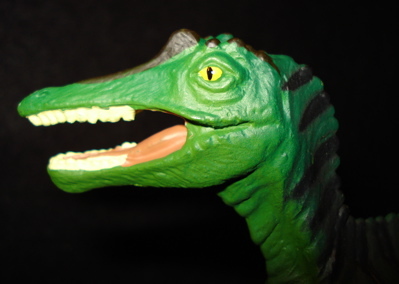 More detailed information about the real Safari Spinosaurus can be found here. Given their large size it is hard for me to imagine that they lived on fish alone, especially given my personal fishing success. 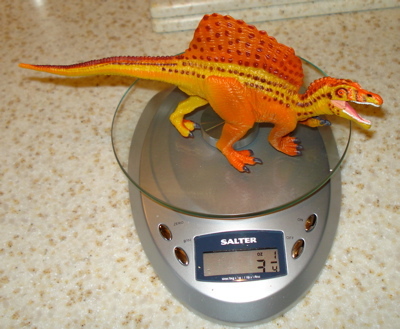 So let's take a look at the Safari Spinosaurus contribution to the Dinosaur toys inventory. 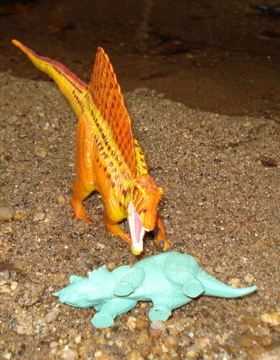 This very attractively colored Spinosaurus, in bright reds and oranges was initially issued in 2001. 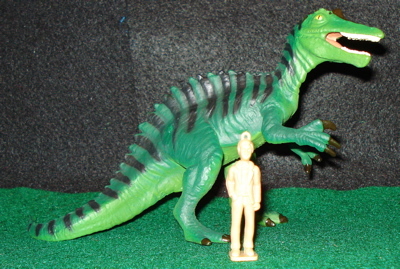 It is one of Safari's earlier, more toy-like Dinosaur toys. Today these are being replaced by more realistic models. The Safari Spinosaurus weighs in at three and a quarter ounces (3.25 oz) aand measures almost nine-inches (9") down the spine from tail-tip to snout. He is what he is and in being what he is his only fault is that his forepaws have four claws instead of the proper Spinosaurus-like three. The interior claw is properly larger than the others, however many. 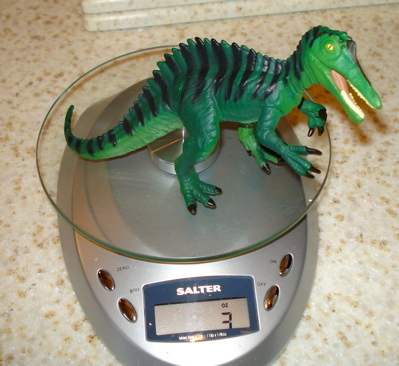 In real life the non- Safari Spinosaurus ~60 feet in length, putting this little guy in 1/80 scale. smaller "sail". Exactly what the "sail" was used or needed for is unknown but endlessly argued over All that we know is that the Suchimimus didn't need as large a one. Our little crocodile mimic weighs in at three ounces (3 oz) even and measures out to eight & three-quarter inches (8.75") in length putting him at 1/55 scale. 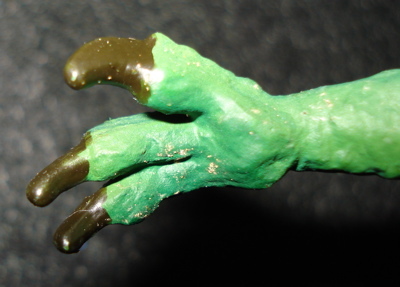 In this case the foreclaw is done properly with two smaller exterior claws and the large "thumb-claw" specialized for catching fish. The release date for this figure was 2005. Both are in production and retail for ~$6.50 each. 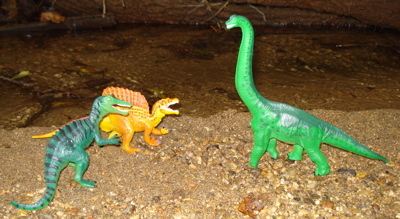 They are part of Safari's "Wild Safari" line of Dinosaur toys. They take a professional pride in their catch and are quite good at what they do for a living. 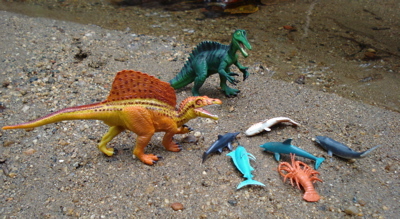 Of course, keeping a five- (for Suchi) or a nine-ton body alive and kicking often takes more than fish and it is suspected (and for the first time we have photographic evidence) that the Spinosaurs were also scavengers and "opportunistic" predators, taking advantage of young herbivores separated from their protective herds. 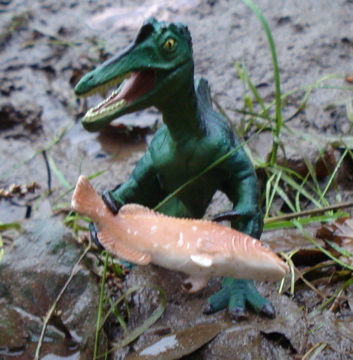 Of course fish were still the Spinosaurus staple diet and protecting their catch, much less catching it in the first place, was never easy. Sometimes defending the catch was relatively easy. 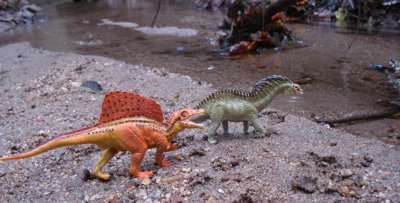 or simply just standing around on a rocky shore the Safari Spinosaurus and Suchimimus are a pair of pretty rugged Dinosaur toys. Ready for whatever play that you want to put them to. 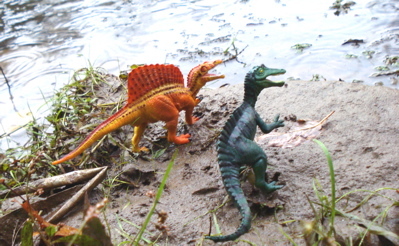 My own suspicion is that their are other Spinosaurs that an adult would prefer but these will make terrific "starter" Dinosaur toys for younger children. Their price point is ideal for the younger set, as noted, at $6.50 a piece. I don't know if these will ever make it to "collectible" status (as many other Safari, Ltd. Dinosaur toys have and will) but they will always be excellent in the toy category. I would like to thank Safari Ltd. (opens new window) for their generous help and cooperation in making this page possible. So, Thank You Safari. 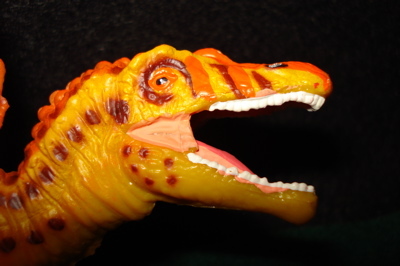 Here at The Dinosaur Toys Collectors Guide we are always wanting to hear from you our readers and visitors. This site is for your benefit and we want to know how to make it best serve your needs. Therefore we have our Contact-osaur-Us form that you can painlessly fill out and let us know what you want to see here.